This presentation – What is the CISMPO Course? 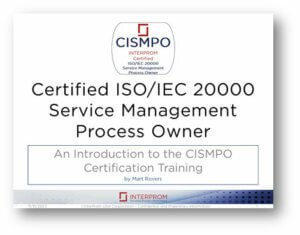 is about the Certified ISO/IEC 20000 Service Management Process Owner (CISMPO) course, which aims to increase the knowledge, skills, and experience of ISO/IEC 20000 service management process owners in order to best prepare them for their role and responsibilities. ISO/IEC 20000 process owners gain a wealth of hands-on experience and practical knowledge during the CISMPO course that is highly interactive and filled with practical assignments and materials that can readily be applied. What is the CISMPO Course?